There are three social constants in the world – politics, sport and celebrity YouTubers. Now unless you are particularly talented, or incredibly viral, it’s difficult to experience any of these first hand. 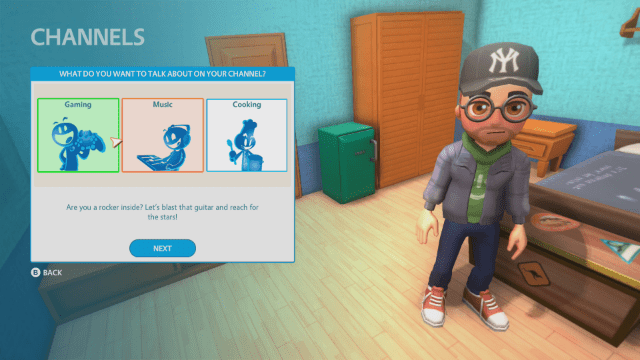 From simulation developers, U-Play Online, YouTubers Life gives you a taste of a PewDiePie wannabe. From the outset, the game presents you with a choice of three different YouTubing careers. You can select from Gaming, Music or Cooking to launch yourself into internet fame. Apart from some minor aesthetical changes, choosing any of these careers does not majorly change the way you will play out your YouTubers Life. 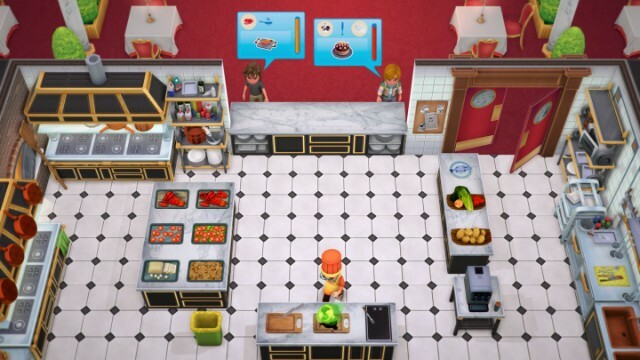 The cooking choice offers the most variety, as you are able to purchase different ingredients to create your own recipes, but, apart from that, the main motivation is to make your name on the worldwide web. The way you do it is to make videos, build the hype, milk the most views and rake in that easy money. Next is to create your YouTuber. You are given a small selection of character creation options, ranging from hairstyles to mouth shapes. 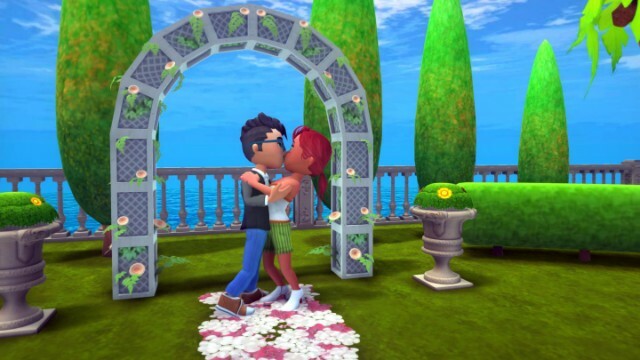 And while it may not be the in-depth, intricate model crafting of The Sims, your cute avatar gives a cartoon-styled depiction befitting the game’s look and feel. You are also given six personality types – given the choice, you could focus on creating the most viral online videos, be the life of the party or chase the love of your life. Whilst these choices offer a couple of different ways to earn experience points, it does not add any perks as to how it affects your life on the web. Basically, all it changes is the wording of your side objectives. In an attempt to give you the motivation to achieve (what now seems like everybody craves!) internet fame and fortune, the game is broken up into “chapters”. Each portion covers your perceived rise to ultimate YouTuber sensation. A future-you narrates over his or her own lifetime, which doubles as a game long tutorial, and the endgame sees you living on a YouTube utopia in outer-space. Well, in their defence, it never said YouTuber’s simulator! At first glance, it’s not hard to see where YouTubers Life gets its inspiration from. Any fan of Maxis’ life simulator, The Sims, will see a few similarities; even the UI screams of The Sims, with time of day, your YouTuber’s hunger and energy levels and, finally, your standing with your web-based community. The second similarity is the cartoonish feel. Drawing on the early Sims games, the characters feel more like anime with the large eyes and pencil line mouths. Characters also seem to talk in incomprehensible moans, gibberish or flat out laughter. The charm wears off after a while, but it never becomes annoying. Then, there is the limitation of the playable area. As is the common perception of YouTubers, you are confined to a bedroom with your chosen career apparatus and your budget PC. In that sense, you never lose focus on what you’re trying to aspire to become. The influences don’t stop there. To begin any kind of interaction, clicking on an object brings up a list of interaction options. The process of creating your YouTube videos begins with the recording setup, which determines how much rendering power you have. Although, weirdly, the type of mouse and microphone you use also affects this. Afterwards, you can determine the type of content, from gaming walkthroughs, music cover videos or recipe guides. 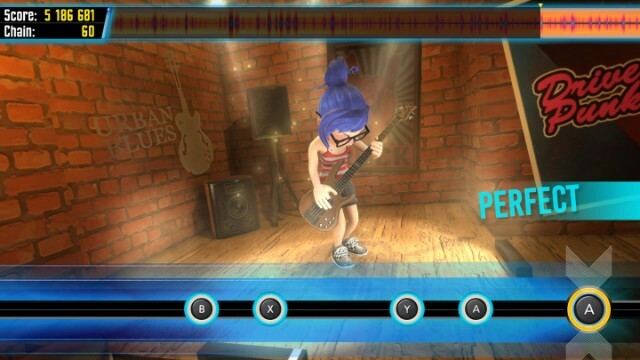 Then begins the recording process – a sort of mini game. First off, you need to gauge whether the content being recorded is high in popularity, with low popularity bringing in low views and vice-versa for high popularity. Recording a set of clips adds points to each aspect of video recording. Scripts, performance, audio, and effects are influenced by perk cards that add extra points to each aspect. 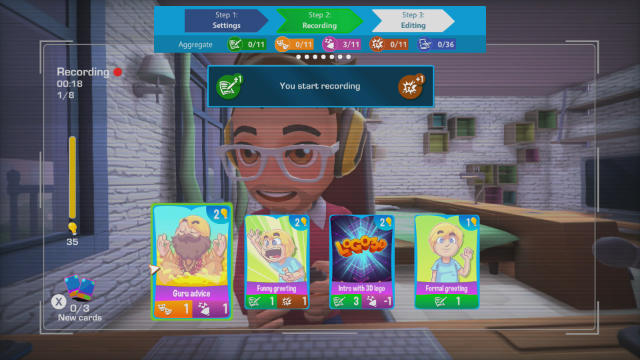 However, you have next to no control over the clips you can record and each also has different points to be added to each video, which can be boosted with the cards. Mixing the right cards with the corresponding clip also adds more options for editing. Unfortunately editing can be painstakingly frustrating as getting each clip to link is more a game of chance rather than hard work, yet, when it all clicks together, the results can be a joy to see. I suppose the cliché should be “quality over quantity”. At least the game rewards you for that. Reaction, transition and ending cards all carry advantages and disadvantages. Whilst some cards have higher points value, they come with the condition of copyright infractions. To right your wrongs, you will be forced to pay a fine or delete your video. And, while a minor inconvenience, the penalty for paying the fine would be easily made up by the money you make from a video. So, the penalty doesn’t fit the crime… sounds like YouTube in real life. By levelling up, you gain access to new cards. Then the game asks you to pick which card you would like to add to your collection, giving the indication of a deck building mechanic. Although you are left with no choice but to pick them all, in actual fact, there is a limited amount and choice, leaving you with a one-in-four chance of drawing a card that will positively influence your video. While not all videos will be perfect, it would have been nice to build your own deck to compliment the types of videos you are able to make, rather than just relying on what the game provides for you. All in all, the video production system works quite well. It can be rather satisfying when the choice of content, the draw of the cards and the amount of editing can produce that one quality video. Videos perform well depending on your online standing too, so if you provide regular content, your channel performs better and grows much faster. Similarly, if your level lowers, the channel begins to lose subscribers. The two other factors that govern your level of growth is social media and event participation. Get a high enough level in all of these and your subscribers are happy, hence you’ll be found ringing in that extra cash. One of the main problems with the early access version, released in 2016, was the balance of how quickly your YouTube channel grew. One video poorly edited with no perks could get you over a hundred subscribers and a few thousand views – (a) It isn’t the reality of YouTubing and (b) The early portions of the game flew by way too quickly. Whilst the balance has been rectified to a degree with this full launch on Xbox One, the slog of endlessly spurting out videos can become a repetitive slog. Come to think of it, they may have nailed that YouTube career ladder perfectly! Whilst the repetition of video-making can be tolerable, yet intuitive, the other aspects of YouTubers Life are not as engaging. To earn extra cash, you can take part-time work, as real-life things like rent and food expenses must also be looked after. Whilst these take place off screen, some jobs come under game development or hosting duties, which could help increase your performance in certain areas. Then comes the social events – like parties, going to the movies and video game promotion events. None of these are particularly enjoyable as they are just there to rack up experience points and develop “relationships” with other YouTubers. The promotional events are the worst offenders, as attending simply replenishes your standing – you don’t even need to converse with anyone. At its core, YouTubers Life is an addictive and fun, yet condensed, insight into how the most influential content creators came to be. The cartoonish outlook to a YouTuber’s rise to fame, and the care and attention you must pay to all facets of your career, is slightly tarnished by the confusing deck-building mechanics, boring social events and slightly repetitive nature. However, through it all, you may well find that a YouTubers Life is right for you.